We were screeching down the runway, engines blasting, accelerating until the shuddering giant leapt off the ground into flight. SOFIA was in the air. The thought of flying on board an airplane that has a hole in its side and carries a 17-ton telescope was a little disconcerting, but after several weeks on the SOFIA project as an intern, learning all about the effort it took to make the aircraft operational, I trusted that we would return to Palmdale safely. 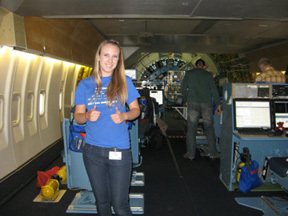 Image right: Cal State-Long Beach student intern Jill Pestana has a big thumbs-up for her experience on a night flight aboard NASA’s airborne observatory, the SOFIA. It was a clear and calm night over the Pacific Ocean. I gazed through the cockpit windows on the upper deck at the billions of stars visible, and thought solemnly that this may be the closest I will ever be to the stars. I pretended I was in space, gazing down at clouds I imagined to be the continents of Earth. Below, on the lower deck, the scientists and flight crew were looking through the telescope at pinpoints in this vast, unknown universe. Sitting at the conference table on the passenger deck, I gave myself a fast lesson in the basics of star formation, using a textbook written by Dana Backman, SOFIA education and public outreach director. Relating the information to my college course material and my knowledge of the GREAT – German Receiver for Astronomy at Terahertz Frequencies – instrument mounted on the SOFIA telescope, I gained a deeper understanding of how complex technologies are used to “look” through the cocoons of dust to see stars forming. Two astrophysicists sat across from me, receiving the GREAT’s real-time data output. “Here, come look at this!” they would say to me over the audio distribution system’s headsets. They turned their laptop screen around so I could see the fresh data on newborn “cocooned” stars in the giant gas nebula known as the Elephant Trunk formation. When it was announced that we were flying at 45,000 feet, the highest altitude flown on a SOFIA science mission, the scientists and I exchanged excited glances. Several hours later, we were nearing the end of the journey home. I was the last of the five interns awake, eating cookies with the astrophysicists as they showed me their compiled data. It was a successful science mission, and everyone was in a good mood. A faint glow began coming from the horizon, so I headed back up to the cockpit for the landing. As the light from stars shining across the heavens was overcome by our own star’s light, I felt a twinge of sadness about my SOFIA flight coming to an end. I was exhausted, but part of me wanted to go right back up to the stratosphere. As I was listening in on the headset in the cockpit, I could hear an Australian airline on approach to California. Land was now in sight as mountains began to emerge beneath snowy clouds. I estimated we were flying right over California State University, Long Beach – my college! With the desert approaching in the distance, I felt such a sense of pride for what had been accomplished overnight. All the effort by engineers, technicians, scientists and managers, German and American, had congealed to produce scientific data from a world incomprehensibly far from our own island of life. I had never felt our species’ innate aspiration to explore and discover more strongly than at that moment. Humbled by the vastness of space, I was beaming with pride and confidence in mankind. I can only describe my experience of flying on SOFIA as beautiful. From the bright stars to the flight crew’s camaraderie to the notion of such a small speck of humanity – me – gazing out into the limitless unknown, I had learned so much besides the basics of star formation that night. I was ecstatic, thinking about the universe we live in. With so much effort being put into each mission by everyone in the SOFIA program, I had to pause and reflect on the words of J.F. Kennedy as he initiated our quest to the moon: NASA does what it does not because it is easy, but because it is hard. My 10-week internship experience has been fantastic. I have met so many great, smart people who have helped me learn all about NASA, SOFIA, science, program management, astronomy, and much more. I had the best summer working with my mentor, Stephen Jensen, and fellow interns at NASA. I’m looking forward to applying what I learned and sharing my experiences back at school, hopefully inspiring others to pursue similar experiences. Because of this internship, I was able to secure a job working with SOFIA’s education and public outreach department, and will be working with Stephanie Sodergren on the department’s website during the next school year. Thank you, NASA, for giving me this opportunity, and for showing the world what humans are capable of achieving.